Use Excel's Get & Transform (Power Query) experience to connect to an XML file. Click on the Data tab, then Get Data > From File > From XML. If you don't see the Get Data button, click New Query > From File > From XML. In the From XML Browse dialog box, browse for or type a file URL to import or link to a file. After the connection succeeds, you will be able to use the Navigator pane to browse and preview the collections of items in the XML file in a tabular form. In the Power Query ribbon tab, click From File > From XML. Important: Make sure you have downloaded and installed the Power Query Add-In. 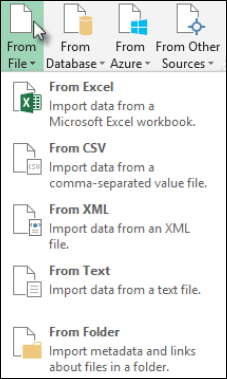 Note: Power Query isn't supported in Excel 2007, but you can use the Get External Data method to import XML data. Click on the Data tab, then Get External Data > From Other Sources > From XML. In the Select Data Source dialog box, browse for or type a file URL to import, or choose the New Source option to link to a file.